How are great skiers created? This is an important question, certainly, and a lot of the answer is laid out in Heluvaskier's great post What does it take to ski like the best (he will play a big role in this article as well). In there, he lays out the path that any skier wanting to improve and ski like the best should follow, with focus on selecting a technical model. With kids, however, although the same principles apply, the coach tends to play a larger role in guiding the athlete/kid towards great skiing (which always has a strong technical foundation, which foundation some discover but most learn). With a solid technical model, the trip is much easier, much faster and the end result that much better - looking at the top of the technical skiing world (WC) those at the top tend to ski very similarly, many of the differences relating more to body shape and ability than philosophy. Here's a real-life story, a peek into the how, a story of such a transformation, with an emphasis on the transformational aspect of changing the technical model. Meet Blue Jacket - you may recognize him from the many drills and ski demo videos and photos we have throughout this website. In fact, this website exists in large part because of him, because he wanted to be a great skier and racer. Most coaches would tell you that this is what they do and they no doubt, aim to do this: to create great skiers like Blue Jacket! For the most part, that is, however, not quite what happens: they don't create them... for the most part, these great skiers create themselves. The detailed technical models required to create this kind of skier are generally lacking and that is a big hurdle - some of the knowledge exists and is taught only at the really high levels, levels that most coaches never get to. Most of the detailed knowledge required to build this type of precise skiing is not even part of the "manuals" and while some is passed around through word of mouth, the fuzzy and coarse models used on average cannot result in great skiing - they can only help the coach to facilitate, to create an environment where some of the good skiers that the coach was blessed with will perhaps evolve into great skiers. Here is one such story, that of Blue Jacket, documented with videos and photos. As always, your mileage may vary so take this only as an example, a true story of how such a transformation could work... for it is indeed, a transformation. Decent skiing on green/blue slopes, but no versatility and no speed control on black runs. Both racer and coach realize that he is going down a dead end approach, technically, and that, to evolve significantly, he needs a radical technical make-over. He could have improved his race results marginally if he continued to ski like this, as he would improve his tactics a bit and got used to putting this kind of skiing to better use, but no chance of success at a higher level, no breakthrough at the higher levels of racing and skiing. So, we enlist the help of Heluvaskier and we create a plan for improvement, which requires a complete rebuild of his skiing, from the ground up... or rather, from the feet up. As a higher level race coach and a dedicated student of the sport, having read a lot of national organization manuals and gone through quite a few training sessions and certifications, I can tell you that serious technical coaching is not taught in most organizations, at least not English-speaking ones1. So, Heluvaskier's help here was critical, in creating the technical transformation plan, sequencing activities and assisting with the progress and help to work through a lot of technique issues along the way. So, next time Blue Jacket is on snow, at the start of the 2015/16 season (having missed one entire season due to an unrelated injury), the plan is put in motion and the journey begins, with a very slow and late eastern winter - which did not help... but anyways, we're on snow. No 1: you tear his skiing apart, break it into fundamental components and re-learn all the fundamentals from scratch! This is a very slow, meticulous and painful process, taking 1-2 weeks of focused 1:1 work (or 2:2 in this case). This period was spent on green and light blue runs, at very slow speeds, working on simple movements and specific biomechanics. During this period, he was not allowed to take even one single run while "on the power" - as the power not only hides but also promotes technical deficiencies. At the end of this first period, he could not really ski anymore, but had started rebuilding new neural pathways for the new movements, small but detailed sequences. The only thing that kept him going was complete trust in the coaching and sheer determination! The old movement sequences still showed every now and then and that was why he was basically forbidden from "just skiing". We kept repeating and refining the new movements and composing them in different ways, according to a pretty specific plan, to engrave them and basically "own them". One of the big reasons why this is not really done much these days is because there is no clearly accepted technical model for the perfect turn... one detailed and precise enough that the components can be taught and learned individually and in a specific sequence1. This I think is one of the biggest issues facing national organizations training their coaches, since most have just "hit these checkpoints" or "work on these skills" but use a simplified or very coarse model. Thus, the coaches cannot build a great skier from scratch, because there is no specific or detailed blueprint. All there usually is, is just improving someone one coarse skill at a time... building small coarse skill improvements on top of a flawed model that evolved in time, as the coach was busy focusing on this or that coarse skill and the racer was trying to get faster! Very few of these ever turn into great skiers! Member-only content avilable (150 words). The second period, another full week of skiing, is where you start piecing him back together, from the new set of movements, the new technical foundation, replacing the old neural pathways with the new ones, creating new responses. This was slowed down somewhat by not skiing 1:1 anymore. This is now about 3 weeks into the process, where both coach and racer start having serious doubts. "Did we screw it up"? "Will he ever be able to race again"? From one of the promising racers in the club, he had become the worst skier of the group! This is the point where I can see many giving up and going back to "just skiing" or "get forward". But, we stay the course, amid the flurry of critical opinions, both solicited and volunteered. It is a long two-week training block (about one spent on snow), where bits and pieces start coming together. All this time, his skiing is something only a technical coach could love - to most eyes, it looks horrendous (well, it was horrendous, but as a coach, I could see bits and pieces coming together and the new movement sequences taking over: this transition was ok, that initiation was actually great, he flexed there etc). You keep fixing bits and pieces, drills to put it together etc. At this point, he went something like 4 weeks without getting "on the power" or having enjoyed "just skiing". Sounds drastic, yes, but it is a critical ingredient! It worked! There's obviously a lot to work on; the alignment is messed up, the boots are bad, the bindings are probably not in the right place etc - but the basics are now there! And there you have it! Yes, the little guy went through the same technical makeover, but less follow-up refinement. The race results were indeed very random in the first season - either a winning run or DQ, as the timing of his skiing was completely off in a course. The second season gets better. Consistent podiums in division 2 and reasonable results in division 1 (FIS). It's not really comparing apples to oranges, as he did not train in the same steep terrain and had less than one-quarter of the time on the course and one-tenth of the race starts, compared to the others at that level. Being a great technical skier is only the prerequisite - not the guarantee of great race results. 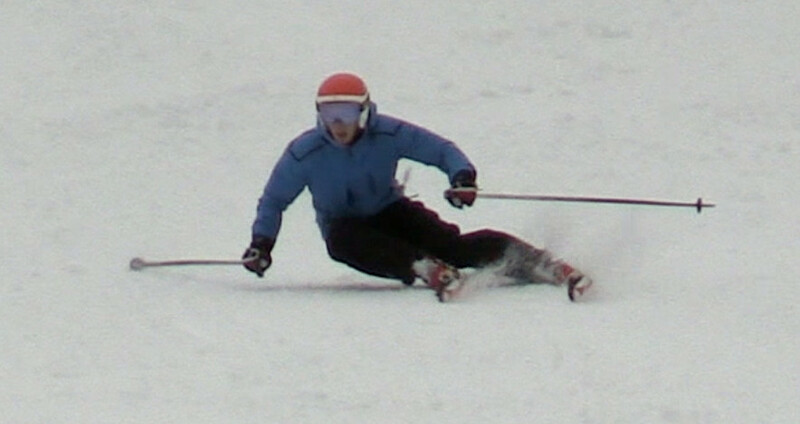 Many racers can hack it and get decent results with horrendous skiing, for a while. Many ski very well on a course, but horrendous outside the course - that was one of the most amazing discoveries for me. That's a hard question to answer. In this case, it took from the beginning of December to the beginning of January, perhaps 12-15 days on snow, to get a complete transformation and put it back together again. But, in the beginning, not only did he not ski well technically, he did not particularly excel at even that poor skiing, very much. It took the rest of the season, another 30 days on snow, to refine it and he's still working on that today! Also, he did not have a good model other than some youtube videos, as nobody in his proximity skied anywhere close to where he was heading, he had no close models. It is much easier when the coach can demo the final result, or there is a model that can ski well enough to demo the different technical elements, the drills etc! Viewed 6208 times ( | Print ) this page.